I began to watch a John Sayles movie called Lone Star several years ago and almost turned it off because it kept switching to new characters with new problems. I can’t remember now how many–six? eight?–but I was completely confused. Fortunately, the writing was great and the actors were exceptional, so I stuck around. And as I watched, those multiple stories slowly converged, and as they converged, they added layers to each other. What had seemed like fairly straight forward character stories became complex, what happened in one story shifted the other, plot points took on different meanings, and I couldn’t look away. As I remember, I didn’t understand the impact of everything until the very last lines of the very last scene. It was a perfect inverted pyramid plot, everything resting on the final words. This episode reminded me of that the first time I saw it. In the beginning, it seems as though the writers are just throwing everything at the screen, something they can get away with because we already know most of these people and at this point would watch them wash cars. We’re also used to watching subplots unfold as the main number plot plays out, so PoI has more time to string the multiple plots out. But by halfway through the episode, they’ve begun to merge and at the climax they all (but one) come together, creating a scene sequence that’s infinitely more interesting because of the plots that have been developed separately before it. 5 A. Root and Shaw start their mission. 7 C. Reese discovers that Root has Shaw. The story slows down here to invest us in Sloan, the number who’s trying to find out how killed his foster brother. 8 E. Carter dealing with Lasky; the HR plot begins. 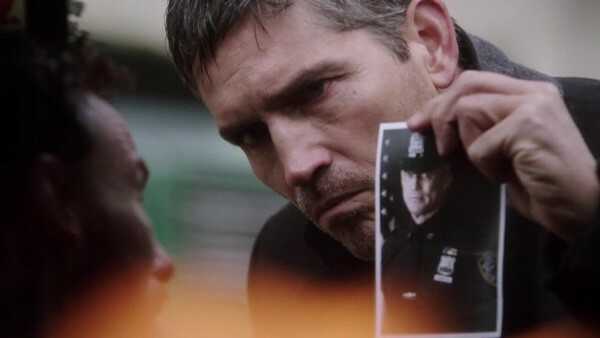 9 C. Reese meets with Fusco, gets more info about Root and Shaw. 10 D. Finch and Sloan find out about his brother’s storage unit. 11 A. Root and Shaw go underground to cut their future escape route. 12 D. Finch and Sloan discover the storage unit. 13 A Root and Shaw break into a CIA pick-up site. (Two of five plot merged). 17 E. Lasky finds out how much trouble he’s in while Carter watches. 18 A Shaw and Root arrive at CIA black site. 21 ABD Sloan’s brother arrives at the black site and meets Root. 23 ABD Finch sends Reese out to stop Vigilance’s assassination attempt. 24 ABD Reese arrives at the intersection and sees Vigilance. 26 ABCD Reese sees Shaw. 28 ABCD Root sets the brother on his way with a new identity. 29 ABCD Reese faces down Vigilance, saves Sloan. Root, the Machine, Reese, Finch, and Carter. In the 15th scene, it’s clear that the conversation the Machine overhears is the plan to kill FInch’s number. In the 21st scene, Root meets the number’s brother and those three plots merge. In the 26th scene, Reese sees Shaw at the climax, merging his plot to save her with Root, the Machine’s, and Finch’s plots to save the number, followed by the big climax in scene 27, followed by Root saving the brother and Reese saving the number in 28 and 29. The plots split again for the resolutions, first of the number plot, then of the Root plot, although the resolution with Root is more set-up for following episodes than a “This is the end” scene. The key to keeping the plots separate in the beginning is that the only PoV character who knows what’s going on is the Machine, which is probably why there’s only one Machine PoV. So four protagonist pursuing four presumably different problems that turn out to be four aspects of one problem, the fun happening as they begin to come together. The one plot that never merges is the Carter/Lasky plot which is important to the season/novel arc, but irrelevant to this story arc. That doesn’t mean it shouldn’t be in there–in a long form like this you have to keep all the plates spinning–just that if this was a movie instead of an episode, those scenes would go. You can see that the writers bounce back and forth among five plots (again, remember that we’re already invested in these people so they can do that), and then begin to pull them together by the one/third to one/half point in the story. The success of this story doesn’t rest as much in the individual plots, although they’re important, as it does in the story movement that brings them together because the underlying idea in this story is that the Machine has moved from number-of-the-day to multi-tasking, which means something’s happening that we don’t know about that’s making her step up her game. • Maybe the Machine PoV at the beginning, but I’m not going to quibble. This was a really well-crafted episode. • The Machine’s Swiss Watch approach to each of the missions, echoed in the writers’ Swiss Watch approach to the episode: Structure as Meaning. • Shoot, all the moments of their beautifully dysfunctional romance starting now. • Root eating an apple while Shaw fights, then tasering the guy when he gets up again. The Machine is playing three different games, and Finch is blocking one of them. Another moment of dual characterization via “A tells B something about B.” Root tells us about the death of Shaw’s father (yeah, really didn’t need those flashbacks in Razgovor), something Shaw would never give up willingly, and government figures wouldn’t care about, and that illuminates Root’s Interface abilities, while Shaw’s reaction tells us what one of her lines in the sand is, plus now giving the two of them something intimate of Shaw’s to share. The “Everything converges at the end” device is, of course, also one of the classic tools of comedy. (For crime/action comedic trainwreck convergence, Guy Ritchie films set the bar, with his first, “Lock, Stock, and Two Smoking Barrels,” the most overtly so.) This matches well with the relative adolescent tone to the Shoot romance. Harold and Reese’s romances (barring Zoe) are defined by loss, but Shoot are in a romcom. The thing that keeps the convergence from feeling too ridiculous and breaking suspension of disbelief is simple: they set up the convergence in the script, with Root’s seemingly non-sequitur actions and instructions at the beginning. We’ve all but forgotten about the “insurance” gun and earpiece, “impact,” and the blow-torched grid, by the time of the climax, and so it is the return of those elements that categorize the final convergence as not just comedic coincidence, but All According To Plan. Down to the recruiting of Shaw, in order to keep the Interface alive. I also appreciate how well-developed the Root heel-face turn arc is. She’s been a villain until now. She was still acting quite villainous in the first three eps of the season. No one but “doesn’t let emotions get in the way of the mission” Shaw could work with her, Root’s kidnapping of her is Root’s usual M.O., and even Shaw doesn’t forget Root’s past, and so captures her at the end. It’s not going to be easy to make Root a plausible team regular, so S3 doesn’t, and works through all of the emotional obstacles over a fairly realistic timeline. And they don’t nerf Root’s characterization or competence to get it, either. 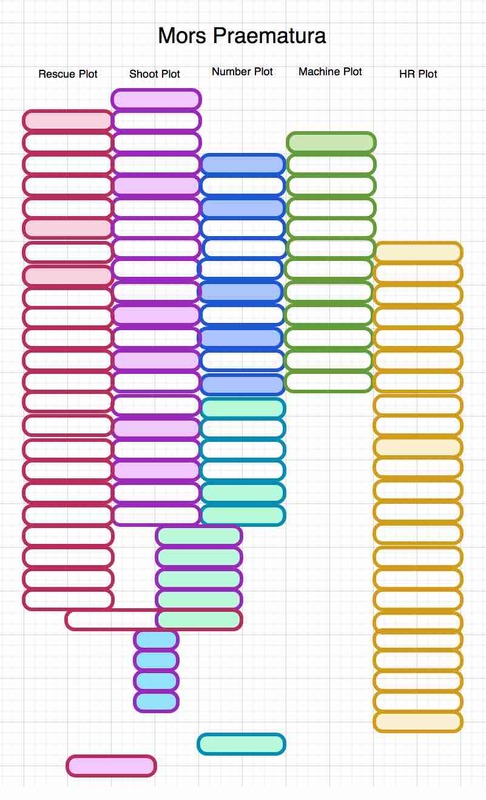 Question: how long should interlocking plots be kept separate? What’s the earliest/latest they should start merging? Act 3 of 5? Act 4 of 5? Frequent brief and individual intersections, but no convergence until last act? Can you think of any examples of merging too early? Or too late? As you pointed out, the inexplicable things that Root is doing (even she doesn’t know why) really are the same plot with the same antagonist. There’s no coincidence involved here because the Machine is controlling things from the beginning, first to rescue the brother, Greenfield, which is why there’s that Machine PoV early (she hears Vigilance planning to kill Greenfield), and then sending Sloan’s number to Finch because she can calculate the probability of Vigilance coming after Sloan after he starts to investigate Greenfield’s murder, something he does before the story starts. So from a writer’s standpoint, it’s one story, four PoV’s, and you block it out to reveal that they’re the same. That is, from the viewer’s PoV, they’re four separate stories that converge, but from the writer’s PoV, they’re one story that grows tighter. So you converge the plot lines at the places in the story where the pressure of events tightens everything, and that’s probably the turning points. So you look at the elements in the narrative to see where the turning points might come because those are going to be the places of great change where you can shift the narrative. Root’s seemingly random kidnapping becomes a Machine-ordered kidnapping as soon as she cuts Shaw’s ties and shifts them from kidnapper/victim to partners. That happens very early in, in the first 10%, followed by Reese meeting Fusco. Reese never stops looking for Shaw, but his focus shifts to the immediate danger for Sloan when Fusco tells him that Root and Shaw are working together, which is easily in the first third. So I’d argue you’d better do some merging by the first turning point/first act/first third of the story or you’ll just have too much tap dancing to do later when the stories merge completely. So in this case, by the end of the first (and longest) act, you’re down to two plots from four (I’m ignoring the Carter plot for now). That cleans up your narrative flow–now we’re just watching Root/Shaw and Finch/Reese in their plotlines. I can’t recall any specific examples of multiple story lines that converged too late, but I can tell you what would happen to the story: the end will feel rushed and readers will be confused and skeptical. This plot at the end would be completely unbelievable–Vigilance can’t even believe it as they see it–except that the whole thing has built up so meticulously, showing the plotlines converging before. Plus it’s all foreshadowed: even though we don’t know what’s going to happen, the minute Root says “Greenfield” in the prison site, we know the plots have converged, so at that point, we know they’re all going to meet at the climax, we just don’t know how. I think your worst case example of that is probably the badly written Golden Age mystery that ends with “You’re probably wondering why I called you all together here.” Any lengthy denouement is a giveaway that the writer wanted to keep things from the reader for a big surprise at the end. Surprise is never as good as suspense, and denouements/resolutions that are longer than a page or two are almost always proof of poor plotting and reveals. The antagonist is really the key. If all your plots are against the same antagonist, even if your readers don’t know that yet, if your protagonists are following the clues/steps needed to get their goals, the plots will automatically begin to converge, ending with the big convergence at the climax. This probably explains why, for high fantasy stories, I prefer smaller scale stuff, or singular adventures, vs. the sprawling politics. Lord of the Rings splinters off into several parties, but since they’re all on the “defeat Sauron” quest, I still care about all of the branches. There are too many non-converging goals in Game of Thrones. This reminds me of an excellent breakdown of the Star Wars climactic battles, and how they started running more and more set-pieces in parallel, with non-converging goals, and that’s part of what made the prequels feel bloated and unfocused, much less effective of an experience. For Avengers: Age of Ultron, the end-goal was to break up the original Avengers lineup. Which meant that although they were all on the same floating rock, fighting together, all of the character arcs diverged. Hence the big 360 team shot paralleling the first movie rings false, because the team is only together in body, not in spirit. Every battle feels like a million different setpieces, one for each character. No wonder the movie felt like it went on forever, after that first “team working perfectly together” setpiece. They did the same thing on Sleepy Hollow. They had the perfect pair of protagonists who were fantastic together, and then they kept them apart. First season was great. Second and third seasons: trainwrecks. Galavant suffered from that in the second season, too. It was a mistake that Leverage never made. In my purely self-centred way I hope analysis if all these multiple individual story lines helps you with “You Again” and then “Haunting Alice” and “Stealing Nadine.” That would thrill me no end. I actually AM happy you feel like writing again. I know it’s on me to look for other authors I’ll enjoy. I have and I am. Hi Argh people, remember, you do you. Oh, Lone Star. Chris Cooper (fans self). Hey, wait a moment. Unless I’m misremembering – I saw the film when it first came out – whole lotta flashbacks in Lone Star. Perhaps we were less sensitive to flashback then. I think I saw it when it came out, so . . . twenty years maybe? I have no memory of flashbacks. I have some memory of scenes from the past that the main character couldn’t possibly remember since he was an infant then?